As the folks at WordPress say, a theme is a basic template for your website. It creates a basic structure which you may then customize. From the super simple Saka, to more complex “page-builder” themes such as Bento, WordPress has literally thousands of themes to choose from in the WordPress Theme Repository. However, the hard part can be choosing a theme. Many people have referred to picking and working with a WordPress theme as “theme wrangling” – getting a WordPress theme to do exactly what you want it to do. This requires a bit of understanding how themes work. The folks in CIRT can help you there. However, we do have some general things to consider and we’ll have some themes to recommend as well. First, a quick note about how WordPress works. The look and feel of a WordPress site is governed by its theme (the template). The content you write, such as the text and images you use in a blog post or a page, is completely separate. That’s the way it should be. You should not be worrying about your website design at the same time you are writing content. Look for the date the theme was last updated. Under that will be the number of active installs, followed by the ratings. As far as ratings go, use your best judgement. Obviously a five-star theme is ideal, but it’s also obviously subjective. Use the ratings as a guide. Just like reviews on Amazon, people like or dislike things for different reasons. Also look at the number of ratings people have given. A five-star rating by one person may not mean as much as a four-star rating by a thousand people. 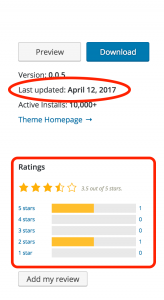 A theme that’s kept up-to-date is one that will keep working when WordPress updates their software. An older theme will be one that will more likely have issues working correctly, or even worse have security vulnerabilities.